Prior to the PGA Show each year, the manufacturers of Trackman Launch Monitors offer a one day training and information session. This year the focus was on their Trackman IV dual radar technology. 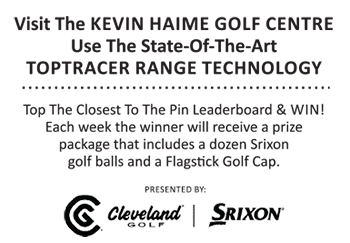 To help introduce the new system they invited teachers such Claude Harmon, Bobby Clampett, and Scott Hamilton, to show how they use Trackman to teach. Also in attendance was PGA tour player Steven Bowditch and long drive champion Tim Burke. It was pretty interesting listening to how Steven and his coach, Scott Hamilton, use Trackman to hone Steven’s game and drive after drive 300+ was pretty impressive. When Tim Burke started hitting most of us were in awe at his power as well as his commitment to his craft. He works hard to be where he is. But what really struck me was the fact that most golfers (the vast majority being mid handicappers) will never be able to hit drives that come even close to the numbers a tour player can put up let alone a long drive champ. The most an average player can expect to gain either by a swing change or an equipment change would be in the 10-20 yards category. It was actually a little discouraging watching these huge drives bombing down the fairway. However, as the saying goes, there is a silver lining in every cloud. And that silver lining is ….. wedges! Yes the great equalizer. You may not be able to drive like a pro but you do have the potential to chip and putt like a pro. The game of golf is won or lost inside 120 yards. Now I am a big advocate of carrying four wedges. My thinking is this, if I am at a distance that is inside 120 yards, there is a pretty good chance that I will be able to match the distance needed to one of the four wedges in my bag. Let’s face it, inside 120 yards is all about getting close to the pin. The closer you get to the pin, the better your chance of sinking your putt and this will lead to fewer strokes. One of the most important fittings that I offer is a wedge fitting. There are several factors that need to be considered when fitting for wedges. Obviously, it is important to have a shaft with the appropriate flex, length and weight. The shaft also needs to be chosen based on its ability to spin the ball or reduce spin depending on your needs. Sole design is probably the most important design element that we must consider. Basically, we will be looking at two elements of sole design. One is how wide the sole should be and how much bounce is necessary. A lot depends on the swing and how much angle of attack there is during the swing. Angle of attack is simply how steep the clubhead is as it approaches and impacts the ball. The steeper the swing generally the wider the sole and the more bounce that is necessary. If the sole is too narrow and with too little bounce, there is a tendency for the club to dig into the ground and cause a fat or chunky shot. Conversely if you have a relatively shallow angle of attack you would not need as wide a sole nor would you need as much bounce. Wedge players with shallow attack angles tend to pick the ball so a narrower sole would be sufficient. Another factor that impacts sole width and bounce angle is turf conditions. If you are playing on a course with soft fluffy lies and fine powdery sand in the traps then the wider sole/higher bounce option will suite you better. If your lies are generally tighter and traps have more course packed sand, then the narrow sole/low bounce option is best. For example, I have been using Eidolon wedges for the past several years. They have a narrow sole with high bounce on the leading edge and virtually none on the trailing edge. For around here they are great. In the sand that is in Florida they are much less effective. They are just too narrow and do not have enough bounce. And finally, we have to look at loft and lies. Let’s start with the lie angle. On no other club is the lie angle so critical. If you were off line 10 yards with a 5 iron coming into the green, I think most of us would say “that’s not too bad”. However, if you’ve got a lob wedge and you were off line 10 yards because of a bad lie angle on the club, I don’t think you would be too happy. These are the scoring clubs and they need to have lie angles that are perfect, based on the golfer’s swing. Then there are the lofts of the wedges. What lofts do you want or need? The loft of the PW is taken relative to the 9 iron in the set. If the 9i is sitting @ 42˚ then it may be that the wedges go to 46˚, 50˚, 55˚ and 60˚ in a four wedge system. It is a good starting point, but there might be some tweaking necessary to achieve the desired yardages. This is where Trackman’s dual radar system excels. One radar tracks the head while the other radar tracks the ball, giving pin point accuracy on the ball flight characteristics. The gaps of the wedges can then be very precisely dialed in. Wedges are great tools, but as you know, having a tool and knowing how to use it are very different things. It is very important that you consult an instructor and get some help in learning how to use your wedges, getting tips on not only the how to but the when to as well. Make certain that you know when it is appropriate to use any given wedge. Having more wedges will reduce your score and seriously increase the amount of fun you are having out there. Good wedge play is all about building confidence. Choose your swing, practice your swing, and execute that swing. The results will take care of themselves. And remember to practice, practice, and practice and consult your local clubfitter for a wedge fitting.